This year marks the 350th anniversary of Rembrandt’s death, and the Rijksmuseum in Amsterdam is pulling out all the stops. To be precise, it is pulling out all its Rembrandts. Every one of the museum’s 22 oil paintings by the master’s hand, all 60 of its drawings and the finest impressions of its 300-plus prints are on display until 10 June in a show simply entitled All the Rembrandts. This is an exhibition that does exactly what it says on the tin. I had never understood just how much the artist means to the Dutch people until the grand reopening of the Rijksmuseum in 2013, following a decade of redevelopment. 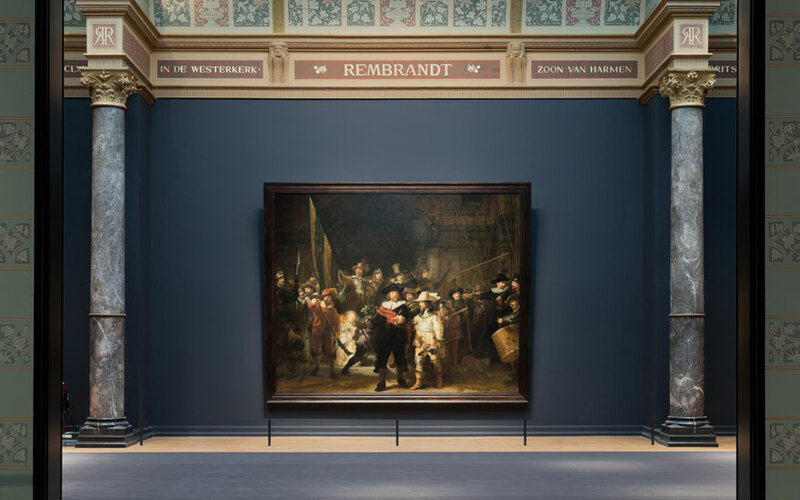 Rembrandt’s most famous painting, The Night Watch, was at long last restored to its rightful home. In any other country, such a delicate procedure would have been effected in secret, probably under cover of darkness. But the Dutch treated it as the pretext for a popular festival. Sealed within a huge custom-made box, the picture was lowered by crane onto a set of wheels, then drawn in slow and stately fashion through the streets of Amsterdam. To avoid ambiguity, the side of the box was decorated with a photographic reproduction of the monumental painting concealed within. It looked for all the world like a carnival float; which, in truth, it was. Thousands of people lined the route of its progress. Children waved flags. Little girls threw flowers. It was a reception fit for a World Cup-winning football team. I have never seen anything like it. The Night Watch will be at the centre of this year’s Rembrandt celebrations in more ways than one. First, it will occupy pride of place at the heart of the anniversary exhibition. Secondly, more or less as soon as that exhibition has closed, the painting will go into restoration. It has not been touched in more than 40 years and is currently discoloured by old layers of varnish. No deadline has been set for completion of the conservators’ work, which may take years. But the Rijksmuseum has decreed that the process must take place in public. The picture will remain on the wall of the museum, encased in a clear glass chamber. Within this rectangular goldfish bowl, the conservators will go about their work. As if that were not enough incentive to keep a steady hand, the restoration will be broadcast to the world online via a live video feed, making for a spectacular exercise in public accountability, as well as the slowest-moving reality TV show ever produced. What exactly is all the fuss about? Like many a famous picture, The Night Watch is at once familiar and mysterious. Its misleading title, which is really a nickname invented long after Rembrandt’s time, has perpetuated the idea that the work is a nocturne. In fact, the action takes place not after dark but at dawn’s first light, as a troop of scattered guardsmen prepare to fall into formation and march in defence of their city. It was first mistaken for a night scene in the 18th century, thanks to Rembrandt’s extreme chiaroscuro, shining a spotlight on some figures while plunging others into near darkness — which has become even darker with the passage of time. Conservation may well make the picture look rather less nocturnal than it does now, though I doubt whether anyone will ever call it The Morning Watch. Its correct title is Militia Company of District II under the Command of Captain Frans Banninck Cocq, which is a bit of a mouthful. It was Rembrandt’s innovation to paint a group portrait that told a story rather than simply depicting a group of individuals; and the story that he told was closely intertwined with the troubled history of his country. The Night Watch belonged to a type of painting exclusive to the northern Netherlands, namely the civic militia portrait. Civic militias had been formed in cities such as Amsterdam from the mid-16th century onwards, largely in defence against Spain, the great enemy from without. In the event, the long Dutch war of independence against the Spanish was fought without the involvement of the civic guards, so the duties and character of militia companies changed accordingly: they guarded city gates, put out blazes and policed the streets. By Rembrandt’s time, they had mostly become drinking societies. Membership was honorific, and their main activity was synchronised boozing. So The Night Watch harks back to a glorious past that had never existed in the first place. The heroes stand gathered. Banners are unfurled, muskets are loaded, spears and halberds are raised to the sky, all to the sound of a gunshot and the beat of a drum. Now Frans Banninck Cocq and his trusty lieutenant give the order to advance. At the double! The Spanish are coming! Rembrandt’s masterstroke was to have created a deceptively convincing picture of an imaginary state of emergency. By 1642, the year when The Night Watch was unveiled in Amsterdam’s cavernous Kloveniersdoelen, the guild hall housing the civic guards, war with Spain was all but over and the city was safe. Yet the artist insists that quite the opposite is true, insinuating the message into some of the picture’s subtlest details. The shadow cast by Frans Banninck Cocq’s left hand cups the fringe of his lieutenant’s yellow coat, which is itself decorated with the rearing lions that were Amsterdam’s civic symbol. So the hero holds the fate of the city in his hand, as he signals the advance to his troops. How flattered the militiamen must have felt. No one knows exactly how much they paid Rembrandt for The Night Watch — each made his own contribution, according to his prominence in the composition — but the total was somewhere between 2,000 and 4,000 guilders: a quarter and three quarters of a million dollars, in modern money. It was the most Rembrandt ever got for a picture. The painter’s contemporaries were thrilled and startled by The Night Watch. They had never seen anything like this animated throng of figures, this drama of light and shade. The best way to understand its originality is to compare it with another, more conventional civic militia portrait commissioned at the same time and for the same building in which The Night Watch once hung. The picture in question is Nicolaes Eliasz Pickenoy’s Officers and Other Civic Guardsmen of the IV District of Amsterdam, which also happens to be in the Rijksmuseum nowadays, and which, compared to The Night Watch, resembles a school photograph. The light is fat and even; the heads and bodies are neatly lined up; the eyes stare straight out at the viewer: the effect is utterly boring. I have my reservations about The Night Watch, although there is nothing I would change about it. For all its vitality and bravura, and even though the militiamen were so sure they had got their money’s worth, I can’t help feeling that Rembrandt had his tongue more than slightly in his cheek when he set about immortalising the militiamen of District II in Amsterdam. The leader of the troop admittedly looks the part, being the very embodiment of martial resolve, but what of the men whom he is urging to battle? Many look way too old — like the grey-haired gentleman staring at his musket as if befuddled by its mechanism — while most look blatantly unprepared. What did Rembrandt really think of Amsterdam’s Home Guard? Were they a real force or a Dad’s Army? And why did he decide to embody the Spirit of the Militia and the Spirit of Musketry — the little girl with a chicken, whose claw was the troop’s emblem, and the little boy in antique armour firing a gun — as a pair of unruly children? The more closely I look at it, the more it all seems like an amateur theatrical performance on the verge of going horribly wrong. One other detail fascinates me. Look to the back of the stage on which Rembrandt has set his creaking pantomime and you will see, just to the right of that slightly smug man in his second-hand helmet with the ill-fitting chinstrap, a half-hidden face truncated to a single twinkling eye and a sliver of bulbous nose. Who is this interloper in the self-important ranks of the civic guard? None other than Rembrandt: he is even wearing his trademark beret. So there he is, the man himself, forever looking at us looking at his picture; and forever wondering, with a chuckle, how many of us will understand what he really meant. What did he mean? The same thing he meant, I think, by all of his work. Namely that, no matter how much we like to put on airs and graces, no matter how much we like to think of ourselves as playing our part in History with a capital H, no matter how much we like to pretend otherwise, we are all in the end just frail, fallible, weak and accident-prone beings: human beings, and none the worse for being reminded of it.